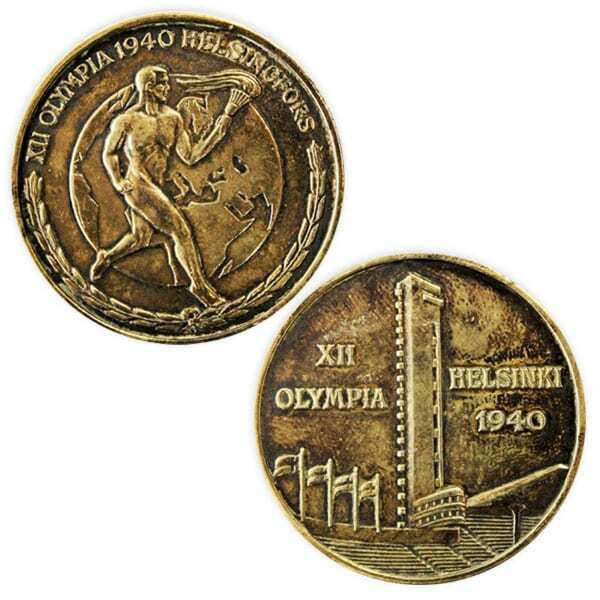 Description: On the obverse the Stadium tower and the text: XII OLYMPIA HELSINKI 1940; on the reverse a runner with a torch and the text; XII OLYMPIA 1940 HELSINGFORS. Other information: Struck of private initiative for the benefit of the Olympic preparations. 2,312 fully finished and 1,338 semi-finished medals were struck by 30 November 1939. After the war they were sold for the benefit of the Viipuri district of the Finnish Gymnastics and Sports Federation (SVUL). In 1976 the remaining medals were divided into groups of three. In 1977 they were acquired by the Apu magazine, who donated them to be sold for the benefit of Finnish Olympic sports, especially for the training of gymnasts, biathlonists and boxers.